Aflur- Eye Drops (Flurbiprofen eye drops) are used to keep the pupils of the eye from getting smaller (miosis) during an eye surgery. This medicine is a topical nonsteroidal anti-inflammatory drug (NSAID). Prostaglandins also appear to play a role in the miotic response produced during ocular surgery by constricting the iris sphincter independently of cholinergic mechanisms. In clinical studies, Aflur- Eye Drops has been shown to inhibit the miosis induced during the course of cataract surgery. Results from clinical studies indicate that flurbiprofen sodium has no significant effect upon intraocular pressure. Aflur- Eye Drops is is indicated for the inhibition of intraoperative miosis. Aflur- Eye Drops is contraindicated in individuals who are hypersensitive to any components of the medication. With some nonsteroidal anti-inflammatory drugs, there exists the potential for increased bleeding time due to interference with thrombocyte aggregation. There have been reports that Aflur- Eye Drops may cause increased bleeding of ocular tissues (including hyphemas) in conjunction with ocular surgery. There is the potential for cross-sensitivity to acetylsalicylic acid and other nonsteroidal anti-inflammatory drugs. Therefore, caution should be used when treating individuals who have previously exhibited sensitivities to these drugs. A total of four (4) drops of Aflur- Eye Drops should be administered by instilling one (1) drop approximately every 1/2 hour beginning 2 hours before surgery. 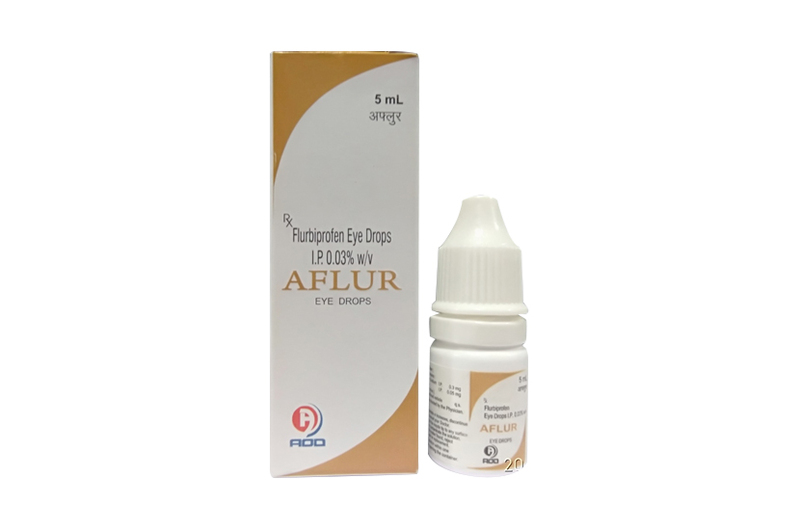 Aflur- Eye Drops is supplied in one White polethylene Bottle packed with printed labelled & cartons And Such 25 Carton Packed in a Shrink Sleeves & corrugated box.